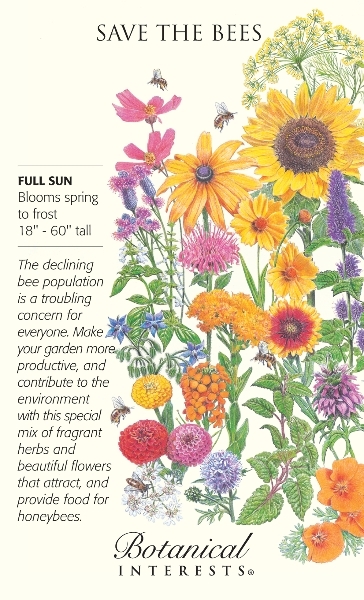 Plant a pollinator garden to provide forage for honey bees and native pollinators. Outside Pride: Excellent source of nectar plant seeds, including rare forage and weed seeds like phacelia, fireweed, milkweed, herbs, borage, white dutch clover. 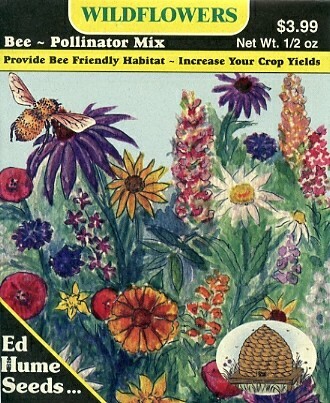 Ed Hume Seeds: Watch for Ed Hume Seed discount coupons at Fred Meyer stores. Bee Pollinator Mix: Flower Species Include: Lance leaved coreopsis, Purple coneflower, Sunflower, Perennial lupine, Annual lupine, Blanketflower, Crimson clover, Partridge pea, California poppy, Mexican hat, Cosmos sensation mix, Lacy phacelia, Plains coreopsis, Butterfly milkweed, Blue sage, Poached egg meadow-foam, Rocky Mountain Penstemon, Lemon mint, Bee balm. Bumblebee Habitat Garden #7270: Attract and feed the happily bumbling bees! You will love the look of our special balanced mixture and the bees will adore its yummy 21-course pollen feast. The varieties are Aster novae-angliae, Borago officinalis, Clarkia unguiculata, Collinsia heterophylla, Coreopsis tinictoria, Cosmos bipinnatus, Echinacea purpurea, Eschscholzia california, Gaillardia aristata, Gilia capitata, Gilia tricolor, Helianthus annuus, Linaria maroccana, Lupinus perennis, Lupinus polyphyllus, Melissa officinalis, Monarda fistulosa, Nepeta cataria, Phacelia campanularia, Rudbeckia hirta and Tithonia rotundifolia. Each ¼-pound bag covers about 1,000 square feet and comes with detailed planting instructions. Annual and Perennial. Height: 18” to 60”. Wildflowers Pollinator Honey Bee Mixture: Available at Coastal Farm & Ranch, Auburn, WA. 14% Chinese Forget-Me-Not, 11% China Aster, 11% Siberian Wallflower, 7% Lance Leaved coreopsis, 7% California Poppy, 7% Purple Coneflower, 7% Perennial Gaillardia, 7% Gaura, 7% Corn Poppy, 7% Sweet Mignonette, 4% Dwarf Sulphur Cosmos, 4% Rocky Mountain Penstemon, 2% Spider Plant, 2% Lacy Phacelia, 1% White Upland Aster. Wildflowers Pollinator Western Mixture: Attracts honey bees, bumble bees and other native bees such as mining bees, leaf-cutter bees and sweet bees. 13% Baby Blue Eyes, 10% Rocky Mountain Beeplant, 10% Siberian Wallflower, 7% Blue Flax, 7% California Bluebell, 7% California Poppy, 7% Corn Poppy, 7% Dotted Gayfeather, 7% Perennial Gaillardia, 7% Rocky Mountain Penstemon, 7% Yellow Lupine, 3% Lacy Phacelia. Lemon Queen Sunflower: Help the Great Sunflower Project with research to understand the challenges that bees are facing by watching and recording the bees at these sunflowers. Lemon Queen is a lovely branching variety particularly attractive to bees. 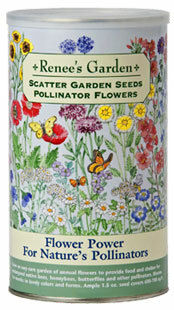 Scatter Garden Seeds Pollinator Flowers: Flower power for pollinators! 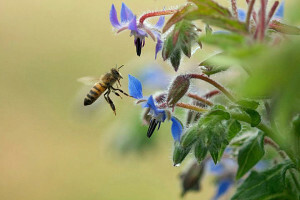 Grow an easy care garden of fast growing annual flowers to provide food, shelter and habitat for endangered native bees, honeybees and a wide range of butterflies & other insect pollinators. Our custom blend of sixteen different varieties will bloom for months in lovely colors and many different forms. Ample 1.5 oz. seed covers 600-700 sq. ft. Contents: 19.6% Chinese Forget-Me-Not, 19.6 % Baby Blue Eyes, 9.8% Single Chinese Aster, 9.8% Cornflower, ‘Polka Dot Mix’, 7.8% Shirley Poppy, 7% Sweet Mignonette, 4.9% Tidy Tips, 4.9% Virginia Stock, 3% Creeping Daisy, 3% Clarkia, 2.9% Globe Gilia, 2% Lemon Mint, 2% California Bluebell, 1.5% Lacy Phacelia, 1% Tall White Alyssum, 1% Plains Coreopsis. 1. Plant lemon queen sunflower seeds. Please check to make sure that the seeds did not receive a neonicotinoid seed treatment. One way to do this is to buy an organic seed. If not organic, check to make sure the seeds weren’t treated with pesticides. 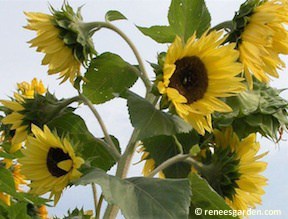 The Great Sunflower Project recommends Renee’s Garden Seeds. They’ve partnered with Renee for a number of years and she has offered to pass along 25% of her proceeds from seeds bought at her website to the Great Sunflower Project. If you use the Coupon Code FR225A and whether you buy Lemon Queen sunflowers to participate in our pesticide research project or some other plants (which you can also use to count pollinators), 25% of the proceeds will be donated to the project. Renee has confirmed that they never pre-treat any of their seeds whether they are organic or not. 2. Submit at least 3 pollinator counts of at least 5 minutes duration to the Great Sunflower Count website. Having more than one count at your site will ensure the most accurate estimate of pollinator service at your site. 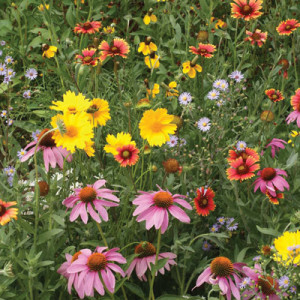 Most wildflower mixes will contain perennials, annuals, and biennials. Site Preparation: Remove as much existing vegetation as possible through pulling or tilling under in order to minimize competition. Loosen the soil by scraping, raking, or tilling. Seed Application: In small areas, seeds can be scattered by hand. In larger areas, you may want to employ a lawn spreader or some other mechanical means. Add 1-2 parts clean, dry sand to 1 part wildflower seeds which will help the seeds spread evenly. Do not use beach sand, as it will be full of salt. It may be wise to spread most of the seed, but to save some for filling in bald spots at a later date. Seeds must come into contact with the soil in order to germinate. Do not bury seeds more than 2-3 times their thickness. Keep the seeded area as evenly moist as possible to help the seeds germinate and the young seedlings become established. Weeds need to be kept under control. Once they are growing, most mixes will not require additional water except in long periods of hot, dry weather. Most mixes should re-grow for several years, but will benefit from re-seeding. Prepare your planting bed: remove all weeds and then turn with a digging fork. Break up all of the big clumps and rake the soil flat. Before planting, mix seed with sand in a can. Then open up the can and pour some of the mixture into your hand. Scatter the seeds, making sure to shake out the seed mixture thinly and evenly. Give them enough space so they won’t germinate in crowded clumps which would stunt the growth of the plants. Sand is easy to see and makes a good indicator of how far apart the seed has been sown. After scattering the seed, use a rigid rake to work the seeds down into the soil to a depth of 1/4 inch. Many flower seeds won’t germinate without the darkness from the soil. Water the seeds in thoroughly and evenly with a fine mist sprayer. NOTE: It’s very important to keep the seeds evenly moist while they are germinating. As plants grow and mature, they will flower in succession and bloom much longer if watered regularly. At season’s end, allow spent flowers to form seed pods and then drop their seeds to bloom again next spring. Save extra seed to cover bare spots. Reseed annually. Cover crops like buckwheat can be planted in March. It grows in a month’s time and decomposes providing natural organic matter. It’s also a good organic way to extract excess phosphorus from the soil. Combining clover with your buckwheat will boost your nitrogen. Cover crops provide an inexpensive way to organically fix nitrogen, build soil, and control pests and weeds. 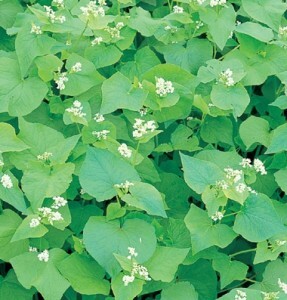 Johnny’s Selected Seeds — Buckwheat (Organic and Nonorganic): Sow Spring to Summer. Germ. Temp. 50F. Fast growth rate. 2-3lb. per 1000 sq. ft. Nectar, weed suppression, green manure. West Coast Seeds Buckwheat: Fagopyrum esculentum. Planted thickly, this tall summer annual has broad leaves that smother weeds. Bees love the flowers, but you should turn buckwheat under about 10 days after flowering to avoid the seeds dropping. Buckwheat is perfect for quick plantings in spring and summer. West Coast Seeds Clover: Trifolium repens. This low-growing perennial clover is for paths and will also add diversity to lawns. It is one of the best cover crops for adding nitrogen to soil because it is so easy to till under. White Dutch Clover cover crop seeds are perennial and slow growing. Flowers attract and nourish beneficial insects. Sow mid-March to mid-May or August to early October. Hardy to Zone 4. West Coast Seeds Cover Crops: Seeds grown as Cover crops are grasses, flowers and legumes that are planted to cover the soil surface. They help to minimize erosion and reduce weed growth in un-planted and overwintering garden beds. Also often known as green manure crops, cover crops, since many (especially the legumes) have the added benefit of enriching the soil. Heritage Seedlings, Salem, OR: Offers Xerces-reviewed seed mixes for pollinator conservation projects. Heritage Seedlings provides plants of source-identified northwest native herbaceous perennials and woody species, and seed of native Willamette Valley upland and wet prairie species. Pollinator plants our PCBA members recommend for attracting the most bees. These offer the best nectar and pollen sources, and are easy to grow. Focus on plants that bloom from August to May — late Fall/Winter through early Spring when food sources are scarce. 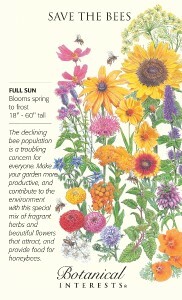 Plant all cold season blooming plants in full sun to maximize bee visit time. Cornus mas — Cornelian Cherry Tree Blooms in Feb. or March. Blooms before Forsythia. Yellow flowers attract bees. Black Gum Tupelo (Nyssa sylvatica), aka Black Tupelo or Blackgum. Its greenish-white spring flower clusters, though very small and largely hidden by foliage, are highly attractive to pollinators and a rich source of nectar for bees. In his new book Garden Plants for Honey Bees, Peter Lindtner rates Black Gum Tupelo highly as a 4 out of 5 star nectar source. Black Gum Tupelo is also of immense wildlife value; some 90 species of birds consume its fruit. It flowers May to June when leaves are half grown. Available currently at Vassey Nursery in Puyallup, WA are two varieties, ‘Tupelo Tower’ and ‘Wildfire’. Some of the best nectar and pollen sources for bees are weeds. Plus they are the easiest to grow! Leave clover and dandelion weeds in your lawn. Blackberries are the source of the main nectar flow for honey in Pierce County.